Has it really been two weeks since I’ve last blogged? Yikes. I’ve been super busy lately, but baby is still in my belly. I have no idea how I’m going to balance everything once he’s made his debut. Grab your hot chocolate and a warm blanket and settle in. This may be a long post since I actually have the time this morning. After all, who else but us crazy Hobsons wakes up at 6 a.m. on a Saturday. 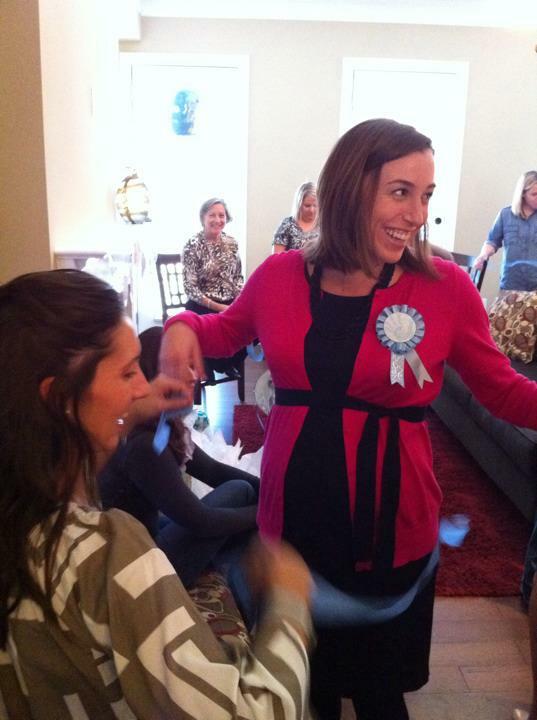 Last Sunday, some of my girlfriends threw me a brunch baby shower in Vinings the day after I turned 32 weeks–wowzer, 8 months! Brunch was a great idea, since I absolutely love breakfast foods. Those who know me well know that I eat bacon or sausage practically every morning for breakfast. My friend Sara even made a gluten-free breakfast casserole that was delicious! 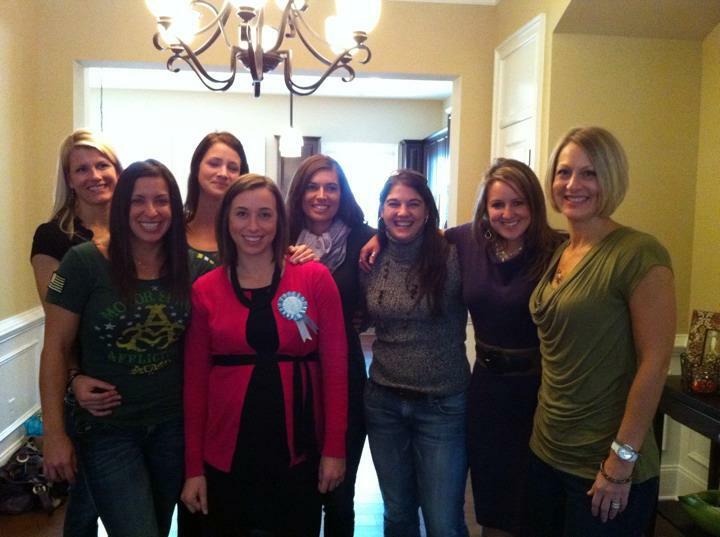 My Atlanta girlfriends, gym friends, Gainesville friends and college friends showed up for the occasion. My first shower was very elegant, and there was no time for games since I was busy opening gifts or catching up with ladies from my hometown. 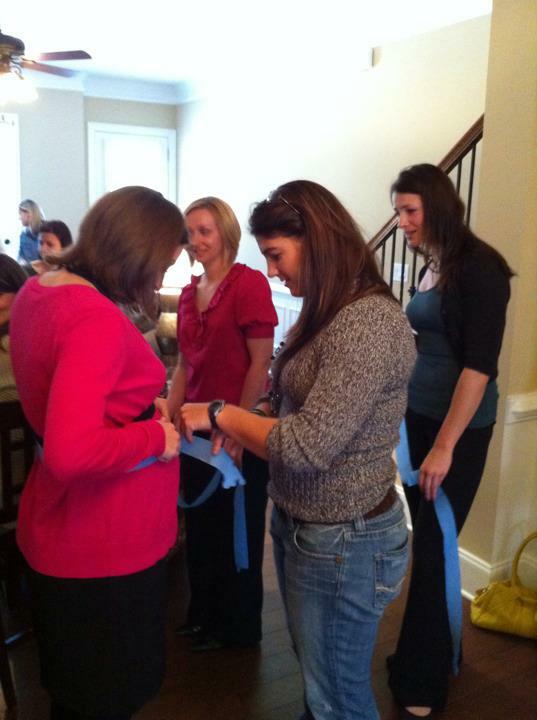 For my Vinings shower, my friends had some traditional baby shower games up their sleeves. First up, thankfully after we had eaten, was the infamous “identify the melted candy bar in the diaper.” I had heard of this game before, but didn’t expect the candy bars to look so real when melted–except for the random sprinkling of peanuts in some of the diapers! I was really bad at this game, only guessing one out of five candy bars. My mom, on the other hand, was the only one to guess all five correctly. After the diaper game, it was “guess the gift” game. Fortunately, I redeemed myself and managed to guess all the gifts by touch. The last game involved guessing the circumference of my belly. Thankfully, we didn’t use a measuring tape. 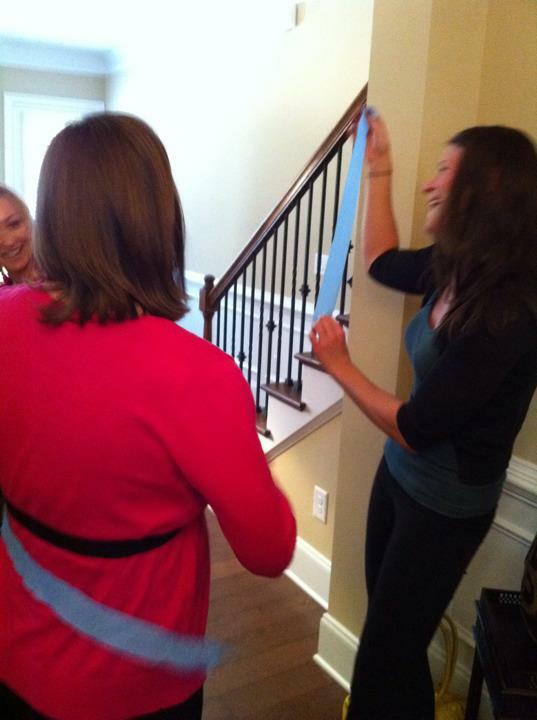 Instead, the girls approximated my belly size by tearing off a section from a roll of blue streamer. Then, I went around to each girl to see who guessed closest. I’m not sure how my friends perceive me–apparently huge! Most had 5 or 6 inches extra in length, and some friends (not to be named) had more than 12 inches of extra streamer! Ha. It was a hilarious game. After the games, it was time to open gifts. Once again, I was overwhelmed from the generosity of my friends. Here are some of the highlights! I got a slew of super nice containers for storing homemade baby food. A cheeky baby manual that James told me last night he has already read! A CrossFit-inspired onesie with a barbell on the front. Santa booties! My friend Lauren thought I was due before Christmas. With my due date just a week after Christmas, who knows when this baby will make his debut. If it’s after Christmas, I’ll just save these for the next munchkin! More workout apparel–we’re starting him young! An awesome designer diaper bag from the shower hostesses! Love love love it! It was a wonderfully thoughtful shower. Baby Hobson is already so very loved!